Power prices have approximately tripled. Other western provinces have experienced no major cost increases with their traditionally regulated electrical utilities. While industry stakeholders and government bureaucrats debated year after year, insufficient power generation capacity was built for a growing economy. The supply-demand balance is now tight as a drum. As a result, the selling price of electricity in Alberta is governed by supply shortages, not by the cost of producing the power. A kilowatt-hour, at peak demand periods, currently fetches up to $1. A reasonable estimate for the cost of this debacle is $5 billion over the next two years. The deregulation disaster raises a natural question: why did the province choose to monkey with one of North America's most cost-efficient electrical supply systems in the first place? Whether electricity should be a competitive market or a state-regulated monopoly has been debated for a century. The first North American electrical utilities competed freely. Six companies serviced New York City in 1887, for example. But around 1910, larger utilities began vigorously promoting the notion that electricity was a natural monopoly. They produced a blizzard of research showing that a single supplier could deliver power cheaper than competing firms by operating with larger economies of scale, balancing the demands of different types of consumers and avoiding duplication of infrastructure such as transmission lines. Proven or not, in the early 1900s governments around the world soon yielded to pressure and allowed utilities to function as monopolies. Across the U.S., states established regulatory commissions which supervised the construction, operation and profitability of power companies. In Canada, governments went a large step farther. All provinces except Alberta created Crown-owned electrical utilities. Alberta's power, in contrast, was generated and delivered American-style by a blend of private and municipal utilities. Each operated as a monopoly within its own service district, regulated by the Public Utilities Board (PUB). Lacking large-scale opportunities for hydroelectric generation, the province naturally turned to its massive supplies of coal. In 1990, British Prime Minister Margaret Thatcher assaulted the status quo, phasing in deregulation of the electrical market. Her hope, in line with free-market ideology, was that competition would create greater efficiencies. In 1997, the U.S. Consumers Union calculated that the efficiency gains due to deregulation in Britain appeared to be perhaps 5%. That is a significant saving, and the actual advantage might well prove larger over time. However, the American consumer lobby group also warned that decades of monopoly have concentrated the electricity market into the hands of strikingly few companies. Particularly when electricity supplies are tight but even when they are not, those large players can manipulate prices. Abuse of market power could potentially cost smaller consumers 30% or more in higher prices, the Consumers Union estimated. Britain's electricity price reductions have been modest, corporate utility profits massively high. In Alberta, however, the deregulatory experience would be far more painful for power customers. The core alliance which usually pushes deregulation in American states usually consists of low-cost power generators (who hope to gain market share) and large industrial customers. In the early 1990s, a similar coalition emerged in Alberta, with low-cost producer TransAlta Utilities spearheading an aggressive deregulation campaign. Many large Alberta industries backed TransAlta. They wanted to generate their own electricity using efficient natural gas turbines which had recently been developed with jet-engine technology. The heat produced by "cogeneration" units could be used in industrial operations, increasing the overall efficiency. The elimination of power losses along transmission lines also helped. Further enhancing the economic opportunity was extremely cheap natural gas. Prices at the time ran as low as 80 cents per 1,000 cubic feet in Alberta. To take advantage of cogeneration, however, industries needed backup power guarantees at reasonable rates, the right to sell their surplus watts into the Alberta grid, and other opportunities characteristic of a deregulated market. Another irritant for many Alberta Conservatives was the Electric Energy Marketing Act (EEMA), which dictated that electricity would be sold at the same price across the province. But power production costs were actually cheaper in southern Alberta, TransAlta's domain. EEMA in effect transferred wealth from south to north, a practice which would end under deregulation. Mr. Klein, Calgary's mayor from 1980 and premier from 1992, had no shortage of supporters pressing southern Alberta's concerns. Conservatives and industries alike were also aggravated by an expensive battle over the timing of new generating units at the Genessee and Sheerness power stations. The PUB's regulators, along with virtually all other private and public authorities in the world, had failed to anticipate the severe oil price drops of the '80s, which had brought Alberta's economic growth screeching to a halt, leaving the province oversupplied with power. But municipally owned Edmonton Power (now Epcor) nonetheless proceeded with an expansion of its Genessee plant. TransAlta and Atco, Alberta's other major generators, did much the same at Sheerness, a jointly owned project. The cost to electrical ratepayers for this premature construction was substantial. To free marketeers, it was ridiculous for political manoeuvres to determine when power capacity was built. In addition, they felt that the speculative risk of new construction should lie with utility investors, not customers. Utilities, for their part, feared having their costs deemed "imprudent" by the PUB and dumped onto shareholders rather than the regulated rate base. Again, a deregulated free market was seen as the cure-all. "It's scary. We're worried we're going to lose companies. People are talking about moving out of Alberta [to B.C. or Manitoba]. It won't take much." An association survey indicates half of its members are considering layoffs. These attitudes may have been short-sighted, at least from the viewpoint of ordinary consumers. Alberta's exceptionally cheap electricity is generated in coal-fired plants. But coal-fired generation capacity takes five to 10 years to plan and construct, and another 30 years to pay out fully to investors. Alberta's stable regulation had allowed TransAlta to gamble heavily on coal power in the '50s and '60s, to the enormous benefit of the province. A free market with unstable prices, whether high or low, makes it far harder to finance long-term projects. Natural gas-fired generating stations, by comparison, are speedier to build--a matter of months for smaller units, a couple of years for large operations. 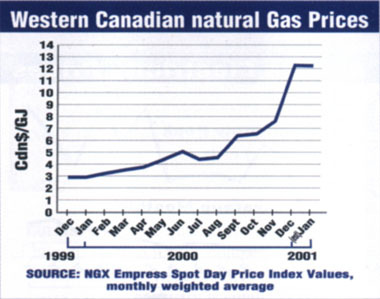 In the mid-1990s, the fuel cost consideration appeared minor and there was vast enthusiasm for gas. The shorter construction lead times and the alternative of building relatively small-scale gas generation units seemed to make old-fashioned stable regulation far less necessary for constructing new facilities. By 1993, power deregulation was a burgeoning world trend which Mr. Klein's free-market backers endorsed. An industry-government task force was formed to negotiate electricity deregulation, headed by energy minister Pat Black (now Nelson). The thorniest question was what to do with TransAlta, whose plants generated about two-thirds of Alberta's power. The company did not want to sell off these assets. On the other hand, every American state which has deregulated did force its utilities to sell a substantial chunk of their generation plants to the highest bidders. It is the quickest and most efficient way to create the flock of suppliers needed to populate a genuinely competitive electricity marketplace. Herman Schwenk, president of the Alberta Federation of Rural Electrification Co-ops until last February, slogged through years of these intensely emotional negotiations. A rancher from Coronation, he frequently found himself at sea amid the specialist jargon around him. Yet Mr. Schwenk advocated what appears in retrospect to have been a sensible compromise: industrial companies would be permitted to generate independently if they wished. The PUB would allow them to exit the regulated supply system in an orderly fashion as Alberta's surplus of generating capacity evaporated. But a "core market" of residential, farm and smaller corporate consumers would be preserved under protective regulation. "Alberta could have developed all the electricity capacity it needed under this scenario. Today's supply shortages and high prices would not have occurred," the rancher comments ruefully. His plea was rejected. Instead, the Klein regime passed the Electric Utilities Act in 1995 and a major amendment to that act in 1998. The law established the Power Pool of Alberta, which would act as an independently administered marketplace for electricity buyers and sellers. Power lines would remain a regulated utility, supervised by an independent transmission administrator. "Only two electricity marketers would deal with us. I wound up having to decide in 10 minutes whether to sign or not, even though I have no idea what the final price will be under the contract. If we are lucky. I'll be paying 500% more than I was." But the initial act ducked the question of how to fashion a truly competitive marketplace. This issue was crucial. Alberta's power industry is small. Due to the province's isolation, not much electricity can be imported. A report from Cambridge Energy Research Associates, a Massachusetts-based consultant, confirmed the obvious: TransAlta, Atco and Epcor all had sufficient market power to manipulate prices. Asked how the province could draw more players into the power market without forcing utilities to divest their plants, Cambridge Energy's Seabron Adamson almost casually suggested a solution: the existing plants' power output could be sold to consumers, traders and other parties for decades ahead. TransAlta, Atco and Epcor would continue to operate their generating facilities at a fixed return, but the juice would not belong to them over the contract period. Instead, the companies which purchased their plants' output would trade through the Power Pool, forming a competitive market. The Alberta government seized on this proposal, although it has never been tried anywhere else. Hundreds of financially important details had to be hammered out, again triggering acrimonious debate between many of Alberta's heaviest heavyweights. Energy minister Nelson, previously a senior accountant from the oil patch, could not achieve a consensus. Precious months slipped by. 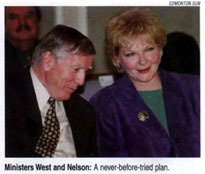 In 1997, Ms. Nelson was replaced by Stephen West, reportedly because the hard-headed veterinarian could be counted on to confront Atco chairman Ronald Southern when necessary. Mr. Southern was crusading personally to push through his version of deregulation. Before taking up the energy portfolio, Dr. West had laid off thousands of civil servants, restructuring departments such as transportation and economic development. He has frequently noted that bureaucrats cannot be relied on to come up with reliable plans to downsize themselves, so he learned to pursue his own ideas. The Vermilion vet followed this independent philosophy with electrical deregulation, a task dauntingly more complex than his previous privatizations of liquor retailing and highway maintenance. Whether his own officials, aware of his fierce reputation, presented him with unwelcome information is questionable. Mr. Klein also has his own modus operandi as a government leader, notably a deep reliance on selected experts. "Do I look like the kind of guy who reads books?" the premier once joshed. He is a former public relations officer for the Red Cross and a television newsman, jobs that focus more on the presentation of information than analysis. As Calgary's mayor, Mr. Klein acted as a highly effective marketing man for policies developed by chief commissioner George Cornish, the actual leader of the city at that time. Each winning bidder committed to buying the electricity generated by an entire plant for 20 years. Enron and Engage are U.S. power companies, TransCanada is Canadian and Epcor and Enmax belong to Edmonton and Calgary respectively. When Mr. Klein headed Alberta's environment ministry, the department was convicted of defrauding Opron Construction on a contract to build the Paddle River Dam. It was the first time that the Crown had ever been found guilty of fraud in the history of the British Empire and Commonwealth. Far from punishing the senior civil servants involved in this nefarious act, Mr. Klein as premier promoted a couple of them, again displaying loyalty to his favoured technocratic policy-makers. Deregulation would prove no different. To design the proposed power auction for existing generation plants, the province assembled an independent assessment team steered by PricewaterhouseCoopers. The utilities, in particular TransAlta, reportedly spent $8.7 million to inundate that team and the government with studies and reports. "TransAlta had ready access to Steve West any time they wanted. We electricity customers could rarely see the minister and he ignored us anyway," complains Dan Macnamara, executive director of the Industrial Power Consumers and Cogenerators of Alberta. IPCCAA's 29 members buy about 40% of Alberta's electricity. 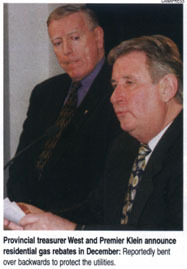 In November 1999, IPCCAA arranged a meeting between Dr. West and representatives for 95% of Alberta's power consumption. "There were CEOs from petroleum, forestry and steel at that session. City and rural consumers were at the table. We all told West that the proposed structure for deregulation would place electricity prices in serious jeopardy. As to Klein, he has never met with electricity consumers. Instead he and West bent over backwards to protect the utilities, who have all profited handsomely from this disastrously expensive process." Mike Cardinal took over the energy portfolio in July 2000. A month later, the government held its long-prepared auction of Power Purchase Arrangements (PPAs). Each PPA committed the bidder to buying the entire output from an individual generating station for 20 years. Dr. West claimed that 40 serious bidders were interested. Wrong. Seven firms bid, and only five won. Two winners were utilities themselves, Epcor and Enmax, the latter owned by the City of Calgary. Selling two-thirds of Alberta's electricity for two decades raised just $1.1 billion. Why did so few companies bid? Because the PPAs were huge contracts. Few firms, even multinational petroleum producers, can afford to gamble on that scale for two decades in a sector they do not fully understand. Mr. Macnamara thinks Alberta ratepayers lost $3 billion in value due to the faulty structure of the PPA sale. Alberta should have abandoned the PPAs, critics charge, after they failed to raise enough money and left far too few players in the electricity market. Under the auction rules, the province had the option of rejecting the PPA bids. Mr. Klein could have changed course and, for instance, followed Mr. Schwenk's proposal for a regulated core market. Or the government could have purchased the PPAs themselves and resold the power in more reasonable quantities, capturing the missing billions. Instead, the Tories ploughed straight ahead. The so-called competitive market would be dominated by just a few big players, the very reason that utilities were regulated in the first place. "An irrigation farmer's electricity expense appears set to rise from $35-$38 per acre to the range of $80. This blow comes when natural gas prices have jumped way up and agricultural commodity prices are low  those factors are going to put some people out of business." Power Pool prices, already rising steeply, accelerated. Industrial and residential consumers, aware that they would be fully exposed to pool prices when deregulation took full effect on January 1, 2001, began to panic. At the August auction, electricity from generating stations with higher operating costs had failed to sell, even for free. These plants represented about 30% of Alberta's production capacity. The province decided to hold another auction in November, again offering this power. Contracts were for one to three years this time, the quantities of electricity much more modest. Forty-five bidders jumped at the chance, again raising about $1 billion. In this second auction, the price for electricity delivered in 2001 rose by about 300% over the first auction--striking evidence that the original PPAs were a multi-billion-dollar boondoggle. Who gained that money? Mostly the PPA auction winners, who will resell their electricity at premium profits for the foreseeable future. Enron, a U.S. power marketing giant, will benefit hugely. TransCanada PipeLines bought its PPA on behalf of an aggregate of big industrial consumers, who will thus escape the power price rises unscathed. But the largest prizes went to municipally owned Epcor and Enmax. Lacking any competition, the latter will now function as unregulated monopoly suppliers to most Alberta residents; both Edmonton and Calgary are currently in a position to gouge large chunks of cash out of smaller communities and rural residents. "As the deadline to sign up for power approached, no one at all was offering industrial electricity contracts in Lethbridge. Power has definitely become Alberta's disadvantage. Manitoba is offering us three cents a kilowatt-hour. Our foundry was established here in 1898, but we may have to move." Also at enormous risk are smaller industries, both urban and rural, who were too small to bid in the power auctions. Harry Irving's family, for instance, has been melting and casting steel in Calgary since 1913. "Enmax offered us power at 20 to 24 cents per kilowatt-hour," reports the Foothills Steel president. "That's outrageous, considering they bought it for four cents. This is a grotesque market failure and I'm damn mad." Foothills has been forced to shut down its melting operation and lay off 24 workers. The company now plans to act as a North American marketer for foreign-made castings. Premier Klein, in a flurry of announcements before Christmas, ladled out $3 billion to subsidize energy bills for consumers and industries. Rebates include $40 a month on electrical bills for 2001, $50 a month on natural gas from January 1 to April 30, and a one-time $300 payment for each Alberta taxpayer. Businesses which consume more than 250,000 kilowatt-hours per year will receive a subsidy of 3.6 cents per kilowatt-hour. Of course, taxpayers are supplying all of this money to themselves out of their own pockets. More dollars will be needed, warns Chris Spearman, who chairs the Industrial Association of Southern Alberta. "There are at least 200 businesses in Lethbridge which must negotiate industrial electricity rates. The province did not warn us how formidable this challenge would be. We've been offered 30 cents an hour from Epcor. Enmax withdrew all offers before Christmas and no one else is willing to sell here at all. Is this what the premier considers a competitive market?" Across Alberta, similar worries prevail among virtually all power-intensive sectors. Resources Minister Cardinal says the government will "monitor" the situation and step in with more cash if necessary. Thanks to high oil and gas prices, Alberta anticipates a budget surplus above $5 billion, giving the government plenty of fiscal maneuvering room for energy subsidies. Mr. Klein, who says he will call an election in March, acknowledges that electricity prices may well cost the Tories votes. But Liberal leader Nancy MacBeth has failed to say what she would do to correct the deregulation snafu, rendering her criticisms of government policy somewhat ineffective. To bring down prices, provincial policy now focuses on developing more power generation, and quickly. AES, a Virginia-based utility, recently announced a 450-megawatt, $450-million gas-fired plant for the Calgary region, to come on line within three years. Calpine Corp., another U.S.-based operator, is planning a gas-fired 250-megawatt plant, also for Calgary. Enmax and Fording are weighing a 400-megawatt coal-fired generating plant and mine near Brooks. Epcor hopes to add a 400-megawatt unit to its existing Genessee plant. There are also industrial cogeneration projects either under construction or in planning, the majority in central and northern Alberta. But most of this electricity supply is years away. Equally troubling, it remains far from proven that Alberta's deregulated market will be large and populated enough to prevent what amounts to subtle price-fixing. In mid-October, the Market Surveillance Administrator--an official responsible for ensuring honest electricity trading--warned that illicit market power may already be plaguing the Power Pool. The watchdog lacks the information tools to be sure, and his report points out that precise definitions of what constitutes illicit trading have not even been worked out yet. To date, oversights and miscalculations on a grand scale have characterized Alberta's ill-prepared experiment with a deregulated power market. At this stage, no one knows how much more ratepayer and taxpayer money will bleed out through its cracks. THERMAL coal in Alberta is much more plentiful than natural gas. Because it is too heavy to export, its price remains stable. If Alberta had continued to develop coal-fired generation on a timely and regulated basis throughout the '90s, that electricity would sell for less than $35 per megawatt-hour today. 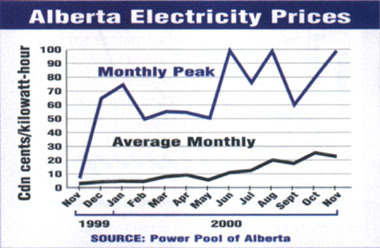 In reality, unfortunately, Albertans will pay at least $100 per megawatt-hour in 2001 thanks to deregulation, and $67 per megawatt-hour in 2002. (These estimates are drawn from the province's second power auction in November.) Since Alberta's electricity consumption averages about 6,240 megawatt-hours, the difference between the regulated and deregulated cost structures amounts to $3.5 billion in 2001 and $1.7 billion for 2002, totalling $5.2 billion. Had sufficient industrial gas-fired cogeneration proceeded on an equally timely basis, a similar saving might well have been realized. Instead, the Klein government in effect stalled adequate electricity development and then deregulated power prices amid a supply shortage. The resulting made-in-Alberta crisis will be the worst government-inflicted blow to the province's economy since the federal National Energy Program in the early '80s. But the economy may weather the storm, due in part to large-scale oilsands projects now under way. JUST a few years ago, industry analysts felt sure that natural gas would remain at less than $3 per 1,000 cubic feet for a long time to come. How wrong they were. This month, the Alberta spot price reached $12. As a result, home heating bills will skyrocket this winter, possibly coming close to doubling over last year. Driving this price surge is increased use of natural gas to fuel electrical generation in North America. Adding to gas demand has been a relatively cold winter, following five warmer-than-usual winters. Hydroelectric power all along the West Coast has been hit by low water levels, again after relatively wet years, so gas-fired plants are working all-out. California, where deregulators paralleled Alberta in allowing minimal spare generating capacity, is now in the grip of a potentially frightening power shortage. The state is drawing power from B.C. which might otherwise be sold more cheaply to Alberta. Although analysts do expect gas prices to decline, just when and by how much is unclear. Rick DeWolf, a senior vice-president with Calgary-based Ziff Energy Group, pegs the Alberta price above $5 two years from now, and at perhaps $4 five years out. Coal specialists have long argued that natural gas should not be burned in baseload power plants because it is too valuable for heating buildings, making petrochemicals and as a vehicle fuel. On the downside, coal also produces more carbon dioxide, a greenhouse gas. [*] But China, India and other developing countries do not seem overly concerned about potential global warming. They plan to generate massive power supplies using coal because it is their most economic, efficient alternative. * My note: That "downside" is not that at all but a boon to life. It is not proven at all that CO2 causes global warming. Historically it has been that when the global climate experienced warming that CO2 levels in the atmosphere increased with about a six-months lag. Besides, CO2 is a natural fertilizer and a prime prerequisite for life as we know it. Life and the biosphere do arguably much better when plenty of CO2 is present in the atmosphere. It needs to be pointed out that the power generating companies were making a respectable profit in a regulated market. The generating costs have not changed in absolute terms. The price of coal is still low. What the generating companies didn't like was that it took 20-30 years to recover the cost of their investment on coal-fired generating plants. The $5-billion estimate addresses only the cost increases due to deregulation of energy consumed. It ignores that along with deregulation it became necessary to restructure the whole energy industry. The costs of that easily amount to another $5 billion during the 2001-2002 interval. Retailing electric energy, and billing for each and every party involved in bringing electric energy to consumers. The consequence of that is that whereas the internal overhead of a single provider for all of those areas of interest was largely and almost exclusively included in the price per kWh paid by consumers, now that the respective responsibilities have been reassigned to so many different players the costs and profit requirements of each player require recognition as separate and distinctive billing attributes. The portion of those costs over and above the cost of electric energy itself now comprises roughly as much as the cost of the energy consumed that consumers, especially residential and average rural consumers, are being billed for. That alone now accounts for about half of the bottom line on power bills. However, there is another factor that drove up the cost of power. That is that the interaction between so many different players requires a massive amount of work to coordinate the sharing of the loot derived from exploiting consumers under the deregulation fiasco/ideology. Unfortunately, much of that has been deliberately hidden from the consumers by legislating simplification of the power bills. Thereby it is no longer possible for anyone to reconcile how the new and far higher amounts that consumers are being forced to pay are being derived. Most of all, it is being hidden from consumers to what extent the billed amounts are not based on actual consumption of energy but rather on estimated consumption figures, and not only that. There is nothing in place that permits to accurately calculate which portion of the loot taken from consumers belongs to which player. When the consumption of energy billed to consumers is estimated or at best based on total consumption in any given month, and when the energy delivered to retailers is being billed on a time sensitive basis per hour, the billing to consumers is necessarily based on nothing more than estimating typical consumption for average consumers with estimated average time-sensitive consumption rates for average days. The inaccuracies inherent in such estimating processes make a mockery out of any claims that billing is accurate and equitable. The complexities resulting from that are so massive that errors in the administration of the revenue-sharing process are commonplace. For example, as of June 2003 there were about 8,000 consumers in the Epcor/Aquila service area that had not received any bills during the last 2 — years. It appears that there is no incentive and not even any contractual obligation for energy providers to address those kinds of problems. Energy consumed but not billed is simply categorized as unidentified energy, and its costs are allocated to and paid by all other consumers. There is so little incentive for producers and providers to address such serious flaws that consumers who identified that they were not being billed were quite simply ignored. Many months after some consumers pointed out the lack of billing, they still receive no bills. Copyright — 2001 United Western Communications Ltd.